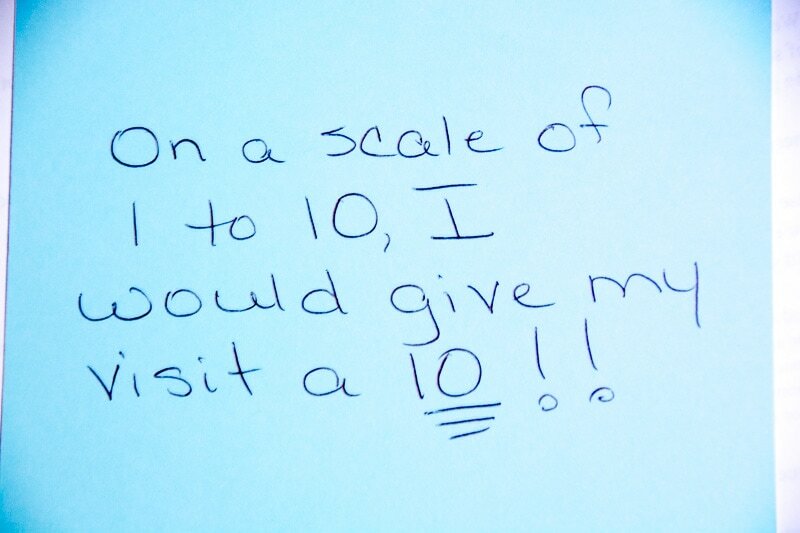 ​At Creedmoor Family Dentistry, we care about our patients. 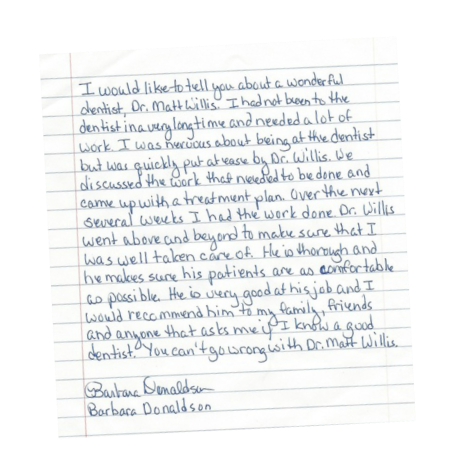 We appreciate very much the positive feedback that we receive from our patients. Dr. Willis and his staff make going to the dentist almost pleasant. He is so honest and sincere, I want to tell everyone about him. His staff is so friendly, what a treat to have them in the area. 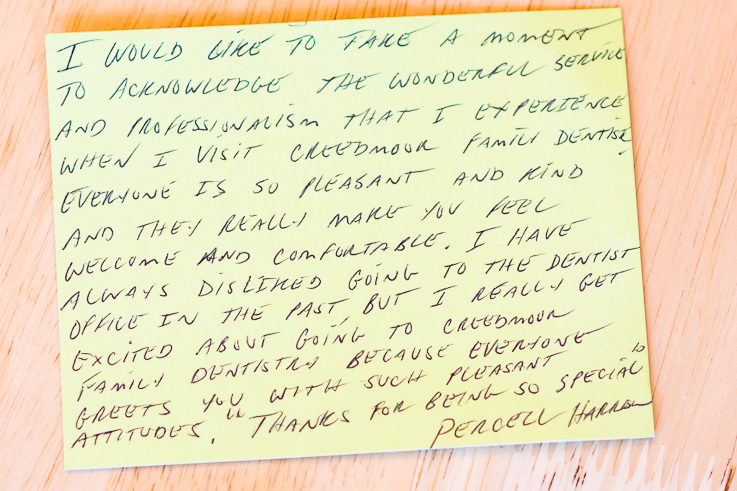 I would like to take a moment to acknowledge the wonderful service and professionalism that I experience when I visit Creedmoor Family Dentistry. Everyone is so pleasant and kind, and they really make you feel welcome and comfortable. I have always disliked going to the dentist office in the past, but I really get excited about going to Creedmoor Family Dentistry because everyone greets you with such pleasant attitudes. "Thanks for being so special." In 51 years, I have never felt as comfortable in a dentist chair as I feel here. Dr. Willis's chair-side manner had a way of calming me down. I would like to tell you about a wonderful dentist, Dr. Matt Willis. I had not been to the dentist in a very long time and needed a lot of work. I was nervous about being at the dentist but was quickly put at ease by Dr. Willis. We discussed the work that needed to be done and came up with a treatment plan. Over the next several weeks, I had the work done. 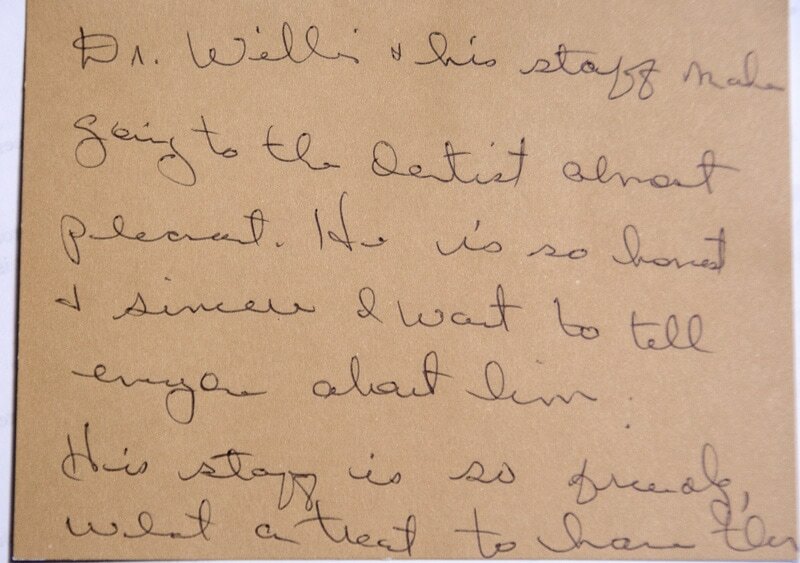 Dr. Willis went above and beyond to make sure that I was well taken care of. He is thorough and he makes sure his patients are as comfortable as possible. He is very good at his job and I would recommend him to my family, friends, and anyone that asks me if I know a good dentist. You can't go wrong with Dr. Matt Willis. Dr. Willis did a fabulous job taking out our son's wisdom teeth. It was a calm and comfortable experience for him. Dr. Willis is fabulous with adults and children. He is gentle and thorough. Highly recommend him!